The CRUM was an invited guest at Brila Summer Creativity Camp. The camp is based on a model for teaching philosophy to children. This means that kids from age 6-12 are introduced to imaginative tools that help us wrestle with the ethical dilemmas of everyday life. In the week that the CRUM led a two-hour workshop, the kids had been learning about POWER through discussions of justice and workshops on comic book super heroes! To help along their exploration of the theme of power, the CRUM decided to make an envelope edition on the theme of ELECTRICITY. What is power? Energy? Strength? Authority? Ability to influence change? Freedom of speech? What are the responsibilities of the artist? Is it fair to do whatever you want? 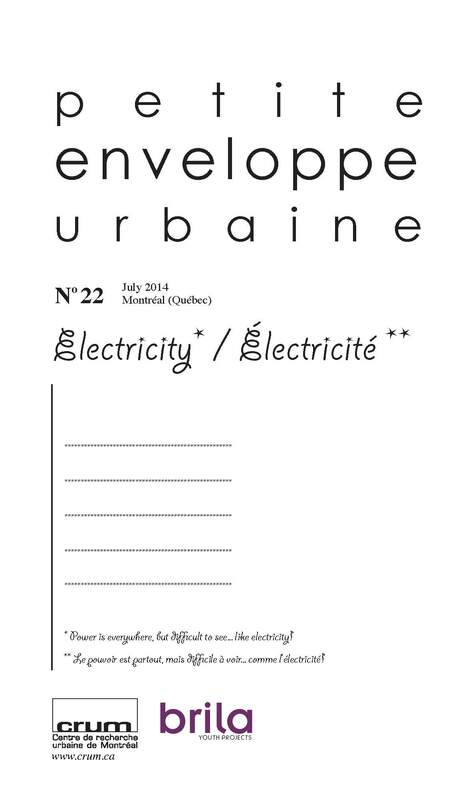 The Petite enveloppe urbaine has power because as a zine its message is repeated multiple times across geographic space to many different people. It also brings the projects of many different people together so their individual voices have more power as a group. The theme of this issue is electricity because ELECTRICITY is a metaphor for all of the different meanings of POWER. The CRUM and the campers brainstormed metaphors as a symbolic means to convey messages through images. So, “power” could be represented by household appliances such as a TV, or even the bio-luminescence of deep water fish! CRUM asks is there power in print advertising for electronics? CRUM demo of stamping, tracing and stenciling letters. M is for music! W is for sound waves! The CRUM also introduced the campers to a variety of materials and techniques that allow you to create multiple “copies” of objects and messages. Collage, tracing, stencils, stamps were all explored as ways to repeat forms. The campers each made 4 of the same “thing” to put in an envelope edition they would exchange between a group of 4 friends. They each took home an ELECTRICITY envelope containing 1 iteration of their own project, and 3 from their friends. This activity explored the theme of “power” through the material process of message multiplication and circulation. The CRUM would like to thank the brilliant enthusiastic Brila kids! The amazing group facilitators and volunteers in the purple shirts! And of course Natalie Fletcher, intrepid Director of Brila Youth Projects! This entry was posted on	August 26, 2014 at 3:15 am	and is filed under CRUM Projects, Publications.